Dolgun Uchaf01341 422269work Guest HouseDolgun Uchaf is a 500 year old building that started life as a late Medieval Hall House which later became a meeting house for Quakers. The old oak panelling and log fire give this 15 centre hall house a touch of character and charm unique to buildings of this area. Located about 1.50 miles from the market town of Dolgellau, Dolgun Uchaf is a small attractive farm with fabulous views and excellent walks including the famous Torrent Walk that passes only a few hundred metres from the house. Dolgun Uchaf is a 500 year old building that started life as a late Medieval Hall House which later became a meeting house for Quakers. The old oak panelling and log fire give this 15 centre hall house a touch of character and charm unique to buildings of this area. Located about 1.50 miles from the market town of Dolgellau, Dolgun Uchaf is a small attractive farm with fabulous views and excellent walks including the famous Torrent Walk that passes only a few hundred metres from the house. Dolgun Uchaf Guesthouse is located in a heart of Snowdonia National Park, just couple of minutes’ drive to the market town of Dolgellau which offers you plenty of places to eat like restaurants, cafes and pubs. Full of character Farmhouse with magnificent views offering well-equipped bedrooms, free Wi-Fi and free onsite parking. The bedrooms are spacious and modern, and some retain original features such as beams. 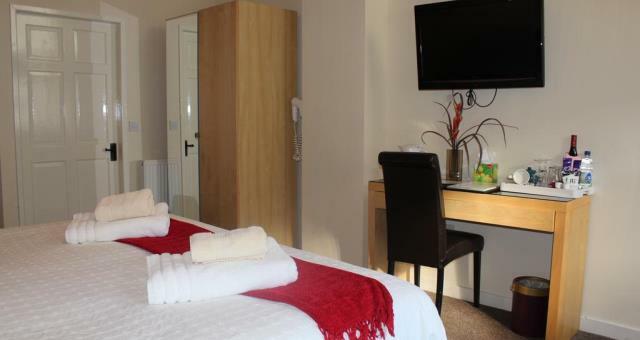 Each of our en-suite bedroom is non-smoking with tea/coffee making facilities, a flat-screen TV, fluffy towels and free toiletries. Ideal place to visit for couples, family and friends offering plenty of activities in the area like walking, pony trekking, beach rides, zip wire, underground trampoline (bounce below), mountain climbing (Cader Idris just 5 minutes away), cycling, fishing, golfing and if you fancy relaxing get away break there is a luxurious Spa located just 25 minutes away that offers you swimming pool, jacuzzi, sauna and Spa treatments. Depending on the rate that you wish to book we offer our guests delicious breakfast where you can choose from selection of buffet food like cereals, local yogurts, fruits etc., followed by full cooked breakfast. We can also cater for vegetarians and gluten free. Situated just off the A470 near the Starbucks and Esso Petrol Station. Follow brown tourism & attraction signs.